It’s not only a meeting of minds, it’s a meeting across the Atlantic, a meeting of acoustic instruments and electronics, and a meeting between organisations. 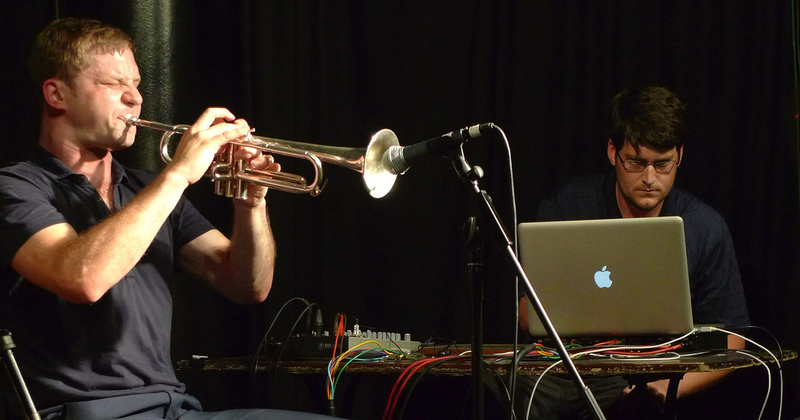 It all comes to fruition over two days in February at the University of Birmingham’s Crosscurrents Festival when U.S. trumpeter Peter Evans and his duo partner Sam Pluta on electronics collaborate with BEAST for workshops and a concert. BEAST (the acronym of Birmingham Electroacoustic Sound Theatre) has been a force for electronic music investigation – and particularly acousmatic music (music composed especially for loudspeakers) – ever since Jonty Harrison founded it in 1982. For the last four years it has been under the direction of Scott Wilson, along with Annie Mahtani and James Carpenter as technical director. New York City-based composer Sam Pluta studied for a Masters in Music at the University of Birmingham and worked closely with BEAST. He has been collaborating with fellow New Yorker, trumpeter Peter Evans - a very exciting player indeed, who has previously worked with Craig Taborn and Evan Parker - since 2008, so it was only natural that he wanted to bring together his duo partner and the group from his alma mater. The catalyst was Birmingham promoter Tony Dudley-Evans, who had previously brought Peter Evans to Birmingham for a TDE Promotions concert as part of the band Amok Amor. And so, as a co-promotion between the Jazzlines programme, BEAST, the Jazz and Musical Technology departments at the Royal Birmingham Conservatoire and TDE Promotions, these workshops and a concert have come about. The workshops will be held at both the Royal Birmingham Conservatoire and Department of Music at the University of Birmingham on Thursday 15 February, and the idea is that a group will emerge from these sessions to play a support slot at the Peter Evans/Sam Pluta/BEAST concert in the BEASTdome, Bramall Building, on the university campus at 7.30pm on Friday 16 February.